Joico K-PAK Revitaluxe Reviews | Does Revitaluxe Work? Embracing our hair's natural texture and color is important for a lot of reasons. For one thing, being insecure about any aspect of one's body can fuel low self-confidence and worth. Being able to feel complete and worthwhile in one's own skin is something millions of people are fighting to achieve each day. However, it's still nice to switch up your look every now and then in order to create a refreshed atmosphere for your personality to flourish. Our hair can be considered our most versatile natural accessory, and it's amazing how a simple cut or color change can alter the impression of your features and overall presence. While getting your hair dyed occasionally won't be harmful long term, utilizing harsh bleaching agents can deteriorate the cellular structure of your hair, causing it to be brittle and prone to moisture loss. A lot of products on the market make lofty promises, claiming they can render damaged hair into healthy, strong strands that will remain silky and smooth long-term. However, many of these claims are misleading, especially since it isn't really possible to repair hair that is already damaged. Most products only seek to mask the damage by encasing each hair strand in a waxy layer that will smooth its cracked surface. Does Joico K-PAK Revitaluxe Work to Treat Damaged Hair? 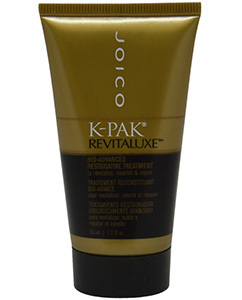 Joico K-PAK Revitaluxe makes similar proclamations of grandeur, boasting that it will instantly reverse signs of damage while also preventing color loss and the dirge of future damage. While the cocktail of naturally derived oils and protein emulsions may be effective on some types of hair, it has not shown to be a cure-all for everyone. This is a product marketed specifically towards individuals with hair that has been damaged and stripped of its essential oils and proteins. Revitaluxe claims to replenish the hair's moisture by infusing it with amino acids and mimetic peptides. While this product has shown conditioning results for some customers, others report that it doesn't have much of an effect at all, particularly on hair that is very damaged. The formula itself is quite thick, which may prove to cause unwanted buildup, especially if you don't wash your hair thoroughly. Revitaluxe appears to act as a lubricant for the hair, coating the outer hair shaft in order to give a smooth appearance. However, it doesn't appear to penetrate the hair strands or offer any restorative properties that are long term. If your hair is extremely ravaged and lacking in moisture, this product may not net you the results you're after. In order to achieve the healthiest hair that is strong and resilient, it's important to make sure your diet is enriched with essential vitamins and minerals that will make your hair grow strong on a cellular level. Joico K-PAK Revitaluxe can be found at a variety of online retailers, including popular drug store chains such as Walgreens, as well as beauty supply stores like Ulta and Sephora. You can also purchase Revitaluxe directly from the Joico website. If you're interested in learning more about more effective hair restoration treatments, click here.